The details of your order will be sent to our warehouse. Once they have packaged your order and sent it out, we will send you another email to let you know that it is on its way. The timing of this email will depend on the delivery option you have chosen. Pending: We have the order but have not started to process it. You can cancel the order when this status is shown. Despatched: We have despatched your order. You will receive an email confirming this and giving you a tracking number. You can obtain an invoice by clicking on `My Account` which will take you through to a list of all the orders you have placed. Simply click on the order number in question and you will be taken to a screen that shows the option to `View Invoice`. Click on `View Invoice` and you will be able to view and print (if appropriate). We realise how important it is to securely store any information that you provide and as a result, we maintain the highest level of security. Any personal information (including payment card details) provided to us will be encrypted to maintain the privacy of your details using high level SSL encryption technology, the most advanced security software currently available for online transactions. If you forget your password access `My Account` and click on `Forgotten Password`. We will send out a new password to the email address originally provided by you when you set up the account. 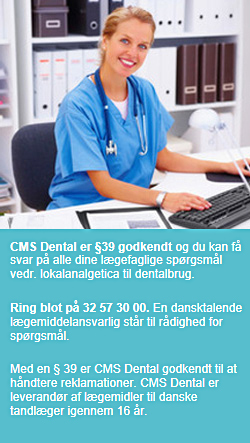 If you have changed email adress please contact us on shop@cmsdental.dk, or +45 32 57 30 00. If you wish to change your personal details simply click on `My Account` in the top menu bar and enter your email address and password. You will then be able to change the details that you originally gave. If you have changed your email address, then go into `My Account` using the email address you originally gave us, and then change it to your new one. Yes. We realise how important it is to store any information that you provide securely. CMSDental.com maintains the highest levels of security. Our site uses high-level SSL encryption technology, the most advanced security software currently available for online transactions. You can therefore rest assured that we take the privace and security of your payment and personal details very seriously. You can tell whether a page is secure as `https` will replace the `http` at the front of the www.cmsdental.com in your browser address window. A small locked padlock will also appear in the bottom bar of your browser window.